Swap out your traditional kitchen sink for a granite version. Granite sinks are durable and offer one-of-a-kind beauty to your home. These sinks can be made in any shape or size in a variety of stone colors. 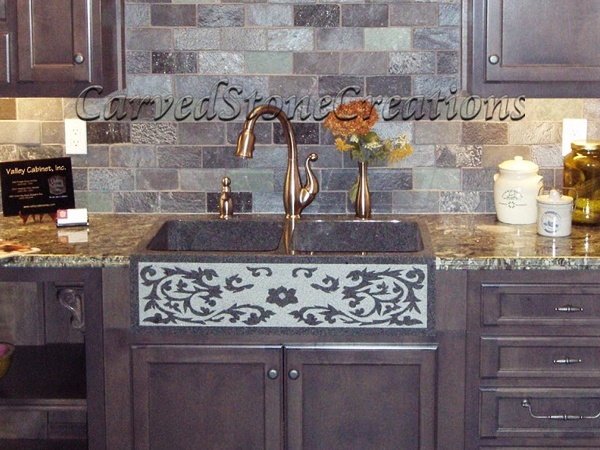 Skilled artisans can even add intricate handcarved details to the front of apron-front sinks. Adding a granite sink to your kitchen will give the whole space a luxurious look. A stone kitchen hood will bring your elegant kitchen design to the next level. Kitchen hoods add height and scale to kitchen designs. Each stone hood is hand carved by a skilled artisan with as many or as few details as you desire. 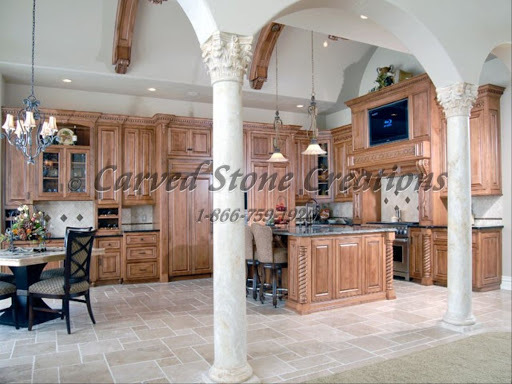 Stone kitchen hoods can be carved from a variety of different stone types, including travertine and limestone. Add natural stone to your kitchen with tile. Tiles can be used as a backsplash or flooring. Stone tiles can be arranged to form many different patterns  from simple staggered patterns to complex mosaics. There are endless combinations of colors, sizes and shapes to make your backsplash or flooring design completely custom. Are you ready to add one or all of these stone pieces to your kitchen? Contact us to start the design process!